- Fixed the thanks and acknowledgement scrolls in Zeroth Level 1S1E to reflect everything in the hold right now. - Fixed 2100 GR warning going off after player already got Serpentskin Suit. - Decided not to change Third Level 2S's yellow door position. All of these changes are aesthetic-only and don't require an update or a playthrough restart. I'm looking forward to everyone's last round of comments on the hold! I'll probably leave this hold here for a couple more weeks, then submit it to the Hold Administrators. ×The puzzle in Tenth Level: 4N3E. I must have tried a thousand tiiiiiiiimes *Adele music in background*, but I simply can't figure out how to keep that Poison Mist alive. I don't see any possible way of keeping the Guardian on the pressure plate, since nothing else in the room moves, so you can't kill anything while standing on it. Not to mention I can't even reach the plate in time myself when I destroy the last piece of mud. Am I missing something obvious? But anyway, the changes you've made in the last content update seem to have fixed every flaw and completed your piece of art! Chapeau! Awesome hold you've made, it's really wonderful. The shortcuts for any level are a excellent idea and saves a lot of time, they could be of use for any hold. Third Level 1N1W: Just realized, I can kill the brain holding no sword!. I always aim for the attack to kill the mud mother, so it didn't mind a lot. Second interlude 2S still crashed the game, It only did when I tried to clear it at the first entrance, after some re-entrances it didn't crash. I continued playing though the hold. For now i am at the eighth level. Fifth Level 2S: You can save 1 yellow key by close-opening the door. It's somewhat unimportant because there are more than enough attack to kill in 1 hit both the mud mother and the babies. Sixth Level 4W: Note that the same mirror can open both red doors (I don't know if that's intended). The Tar mother with both brains do too much of damage, so if aiming for the max attack, it don't have any sense to kill 1 brain and left the another alive. An idea i have (if you want to change it) it's that you need to spend separately 2 green keys for each red door. Seventh Level 6S 1W: Killed 1 guard and used 3 yellow keys and 1 green to get the blue one. It's really possible to get all with only three keys? After eight level noted a secret room on 1N 2W. Luckily it didn't have attack, would have restarted everything for sure. Well, last comment about the hold. Record of the mini-game in Seventh Level 9S 2W: 52 hits(1300 hp). Had to optimize the entire mini-game since i entered with ~~1450 hp. Noticed the detail that your record and the life you recover it's the same. It's the first time I've managed to reach this far, so I didn't know anything about the levels and their structure. 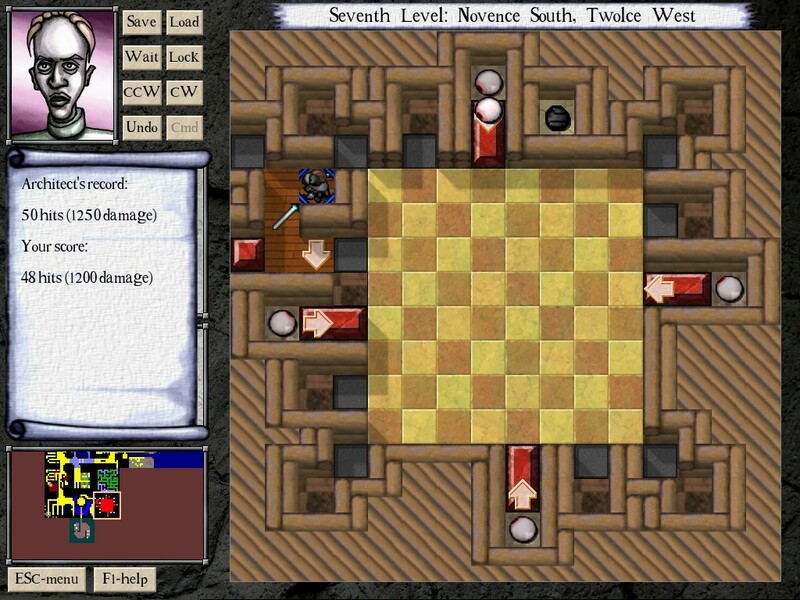 In ninth level 1S 1E there is a yellow door which goes to a room with a knight shield. Replayed a lot of rooms only because i aimed before for the wyrm piercer, and it was very late when i saw it. Showing what's in the room before opening it (like the steel shield) or moving the yellow door to the room would have been helpful, I hadn't any yellow key to use. First Interlude: The Entrance - when I stepped on the special square I got a "well done on completing the hold" message. Was that supposed to happen? I feel I have some more pie-seeking in me. Nope, that particular level entrance was just misassigned. I've fixed it now and uploaded a new April 14th version. There's no changes other than fixing that one NPC. I did a quick check and I don't think there are any other broken inventory squares. Still, if you do run into any more, let me know. Okay, I've submitted the hold to the Hold Administrators now. Thanks everyone for your comments, and I'm looking forward to future playthroughs and highscore competitions! I definitely didn't expect to beat that record. My first few attempts were in the 1800-2400 damage range. This has been a fantastic hold so far, and probably the one I've spent the most time on. At one point I made it to the final boss and I was so far short on health that I nearly just gave up on the hold entirely; did another full reset just on a whim and noticed rooms where I had taken literally thousands more damage than necessary! I feel like every time I go through the hold I notice another few more superior room solutions that shave off another few hundred points of damage. The balance between puzzle solving and standard optimization is nearly perfect. Okay, uploaded a new version for HA review. Here's some changes that will make it into the final version on the Holds board! - The north part of Seventh Level 1S1E now has tar babies and greckle gates to lengthen the fuse by 2 tiles, instead of green doors. Still probably never worth taking, but it's less of an onerous penalty to skip that puzzle now. - Used custom characters to speak noises like bloooomp.ogg, QuickScrape.ogg and HugeDoor.ogg so I only have to include those sound files once in the hold file. As a result, hold filesize decreased. - Added a few more lines of incidental speech. A fun and challenging hold that definitely has its replay value for optizimation. Several non trivial puzzles that took a bit to figure out. Overall the balance seemed to be on point for such a massive amount of rooms. Managed to complete this hold on the 3rd try (5176 HP left, 0 keys). I've quit the first attempt on floor 5 or 6 and the 2nd on floor 9. Could probably have gone a bit further but without having a rough idea whats coming up soon mistakes are bound to happen. 2nd interlude seems to still have crash issues at twice south. Seems to happen when the mimic is at 3,14 a lot of the times. Thanks very much for the feedback! I agree with most of your points raised; while I don't think I'm going to update the hold I'll definitely take all this into account the next time I build an RPG hold. After thinking about this for a while, I think there's no point in hiding rooms with secret walls or hard-to-spot paths. All it does is delay people finding the resources inside them, and make the first couple of iterations (where people don't find the rooms) sub-optimal. That said, it's certainly fine to hide rooms behind powerful monsters, or tricky room contraptions such that you can only get to them by performing certain actions or solving puzzles, and thus putting appropriate rewards behind them, as in that case the "hard-to-get-at" room is easily visible and a goal right from the first playthrough. Definitely agree that this is kind of pointless; the vending machine was just a quickly-made failsafe to "guarantee" that the player would never run out of green keys, but running out of green keys entirely isn't ever actually a problem if the player isn't spending green keys left and right. It's solvable without the hook; you don't need to spend a yellow key there. To give a small hint without spoiling it entirely, there's a big difference between a pressure plate and an orb. That's sort of what I did in floor 6 itself, but afterwards I figured there was no difference between having those kinds of greckle barriers and not having them, since the player's greckle counts would be so high. At that point, yellow/green doors and monsters blocking the way are more meaningful, and this just saves the player time bumping into a bunch of doors. Here's an update that makes the final level a bit easier, after it was brought to my attention by Nuntar and ThemsAllTook that the final level could be really difficult if you got there without getting all the ATK in the hold, or were low on health. 1N4W: Added Opticon -> yellow key trade, to give a preview of a monster that can be seen in the next level. 7N1W: Added +10 ATK and +500 HP. Added +500 HP behind a yellow door. 5N3E: Added yellow key -> +500 HP trade. Added Steel Knight -> 2000 HP trade. 2N2W: Added green key -> +800 HP trade. Added 2 cave fegundo -> yellow key trade. 7N3E: Removed a green door and moved a +500 HP potion so it wouldn't get blown up by a bomb. Now the green door path is probably actually worth taking if you can spare the key. 3N2W: Moved inventory square so it's not in the way of auto-travel.